When one chapter on the book of life closes, usually another opens – the thrill of exploration and openness brightening horizons for another day. 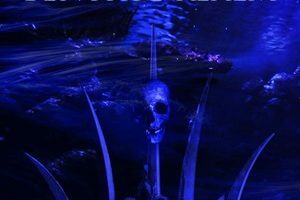 Following the unexpected demise of Massachusetts act Second Grave, vocalist/guitarist Krista Van Guilder and bassist Maureen Murphy move along with this new trio Benthic Realm. Active since July 2016 with drummer Brian Banfield (The Scimitar, Blood Stone Sacrifice) completing the lineup, they set about writing new material and playing out locally, preparing fans for the following self-titled three song EP. 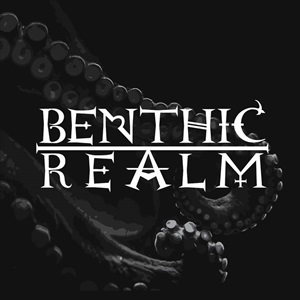 Considering the decades of love, spirit, and musical acumen for doom metal, it’s not surprising that Benthic Realm reside in that slower comfort zone. Stripping things down to the bare bones essentials places more emphasize on thick, crushing tones which shake foundations and move mountains – the type of riffing and tempos that reach back into 80’s Candlemass or Crowbar for instance. Krista’s range as a vocalist remains unparalleled – metal to the bone, sending shivers to the spine even in lower register verses for “Awakening” just as much as when she holds those upper tier notes for the follow-up “Don’t Fall in Line”. Measured lead break work also twists from conventional form, enhancing the melodic/hook aspects of the tracks – proof that you can squeeze out more emotional context even in smaller doses. The final song “Where Serpents Dwell” at 8:32 opens with an echoing guitar refrain before the rhythm section builds the foundation, a tour de force doom arrangement that feels as spacious as necessary with strong instrumental interplay to drain you of any natural stress or pent up tension for maximum release. Given the proliferation and mutations of doom these days – as musicians incorporate aspects of stoner, death, funeral, and gothic elements to the mix – it’s also enjoyable to hear Benthic Realm deliver a classic style of doom metal that’s European-influenced while executed in a professional manner. Plenty will gravitate to Benthic Realm based on this impressive debut.